No matter how dilapidated or drab a home is, extreme renovation can transform its look and feel dramatically. And the same holds true for bathrooms. So today, we are going to let you take a sneak peek at the magical makeover of a gloomy and shabby Italian bathroom from the 70s. 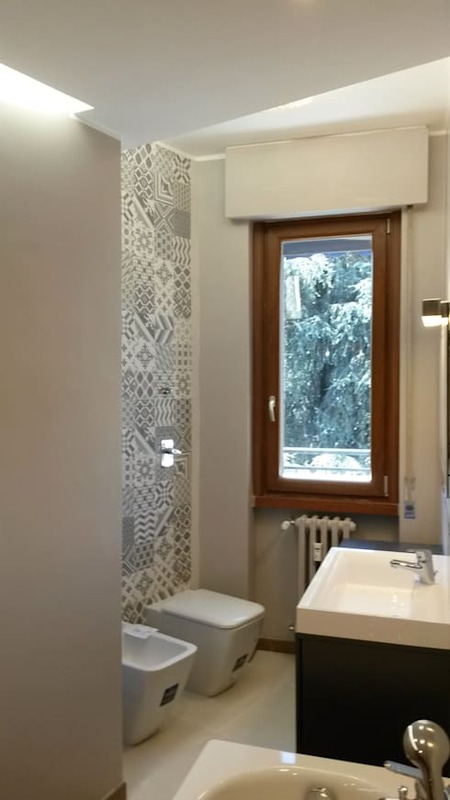 Thanks to the architects at Architetto Alberto Colella in Milan, the revamped bathroom is a delightful sight to see. It’s contemporary, bright and soothing on the senses. And all this was achieved without shifting the original walls or changing the layout of the bathroom. 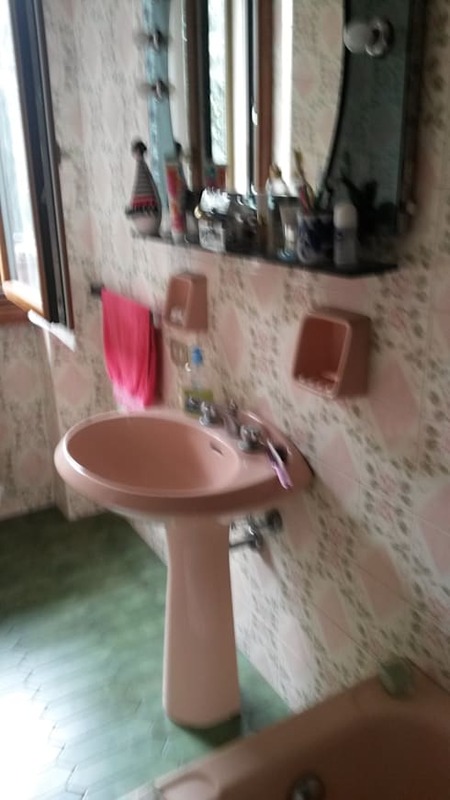 Dark green floor tiles and the busy pink wall tiles made the bathroom look like something unearthed from the ancient past. These looked passé and needed an urgent refurbishment. 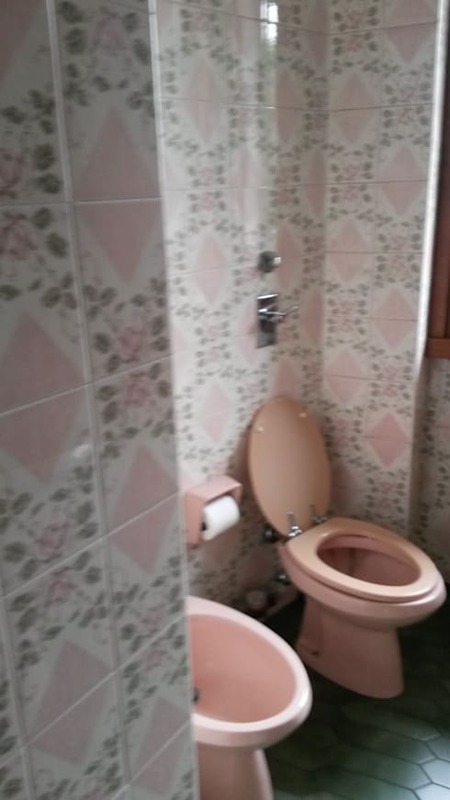 From this image it seems that the bathroom might have been aesthetic at some point of the time, but now, it was lacking in style or comfort. An old-fashioned pedestal sink, a drab mirror with a cluttered shelf and dull soap holders fixed to the wall made no positive impression. By changing the materials for both walls and floor and altering the listless sanitary wares, a whole new look has been achieved for the bathroom. 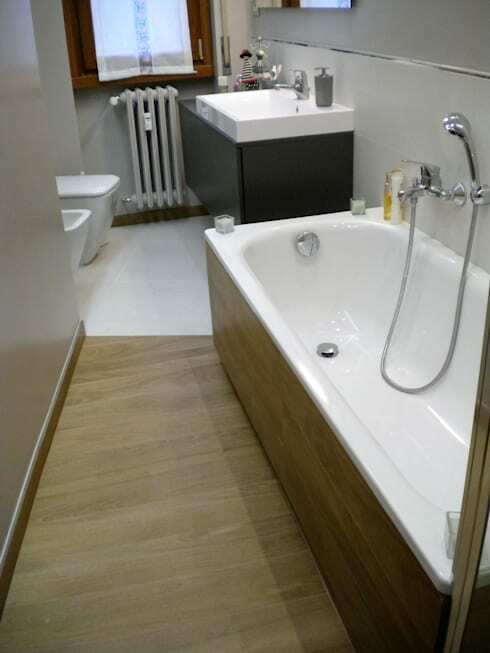 The warm wooden floor, the smooth walls and the trendy sink cabinet make the bathroom modern, chic and functional. Decorative tiles with geometrical patterns all over them now adorn the wall next to the window in a very creative way. The sleek wooden frame of the window adds warmth and a hint of organic charm here. Post renovation, the bathroom looks very complete aesthetically as well as functionally. Neat and modern designs, a smart shower space, a comfortable tub, a practical sink and fashionable WC and bidet make the bathroom rejuvenating and sensible. 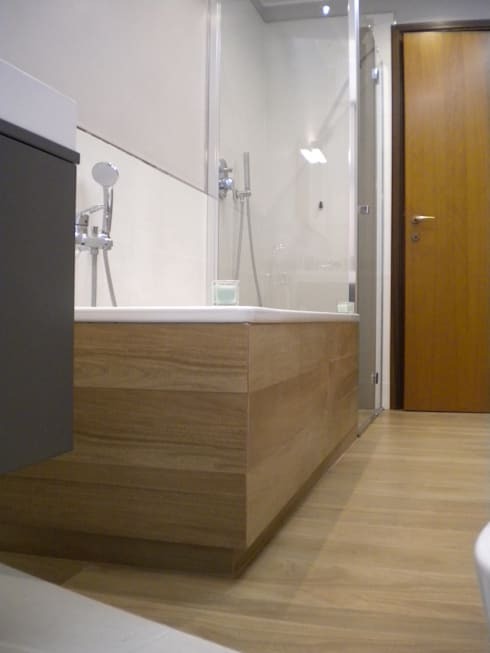 We admire how the bathtub is clad in oak wood and complements a part of the floor beautifully. This makes the bathroom warm and cosy, while the glass shower door ensures style and openness here. 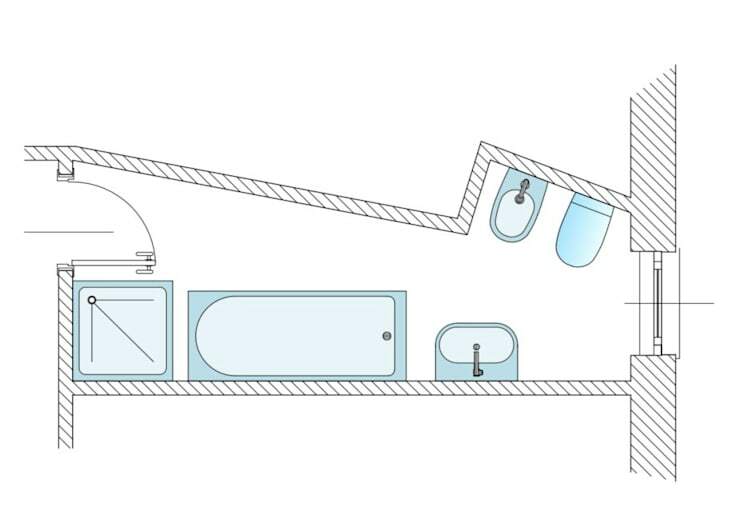 The latter allows light to travel freely in the bathroom, making it appear bright and spacious. 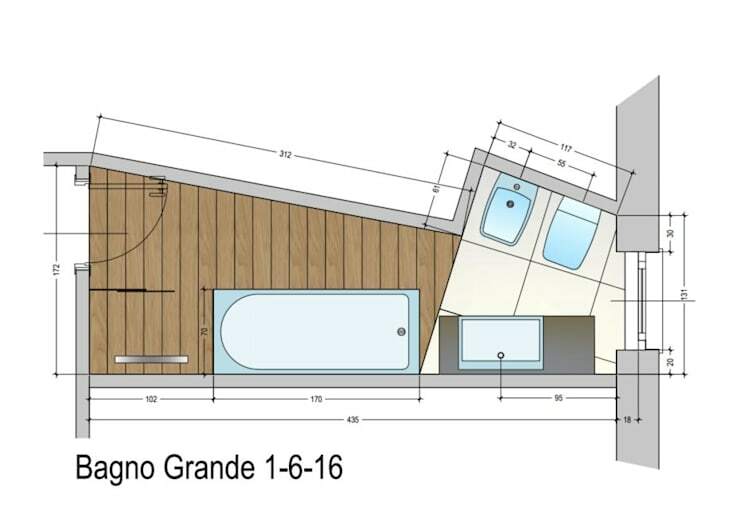 The original plan makes it very clear that the bathroom had an irregular layout and an awkward distribution. But the location of drain pipes and sewage lines made it impossible to shift walls. So let’s see what the architects did to make the situation better. As is evident from this plan, the bathroom walls were left intact but the floor was altered for a contemporary look. 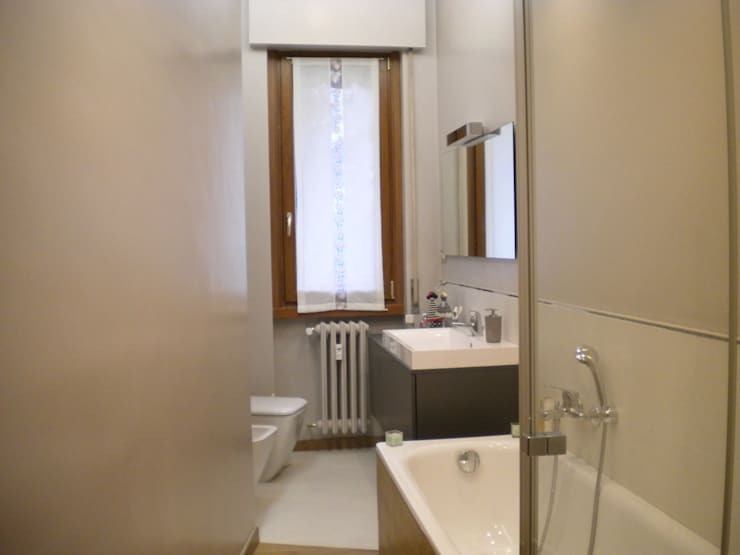 Now the shower and bathtub enjoy warm wooden flooring, while the sink, WC and bidet are surrounded by tiles. The final outcome is very trendy and unusual.